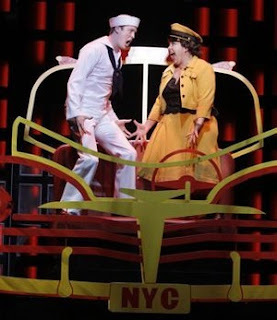 Matt Owen and Sarah Rudinoff in On The Town. “The minute I started rehearsing, it brought Ruth [her character in Wonderful Town] back into my mind. You totally like these women and you want them to succeed,” said Rudinoff. Unlike the Midwestern transplant Ruth, however, Hildy is a tougher character, a true New Yorker. “During the first week of rehearsal, Bill [Berry, the director] said don’t use any of the soft tricks. Believe that she is this super aggressive,” said Rudinoff, who gave her Hildy a Brooklyn edge. But at least in this show, Rudinoff can get both the guy and the cab. “I love my cab. I have a big duet in it with my love interest Matt Owen (who plays the sailor Chip). It’s a cab that you can fully stand up in. Incredibly bold colors. In rehearsal, we rocked it so much getting in and out, that they had to put sandbags around it to hold it in place. We are putting miles on that cab,” she laughed. After the show closes, Rudinoff returns to singing with her band We Are Golden as well as looking at developing a new solo show.